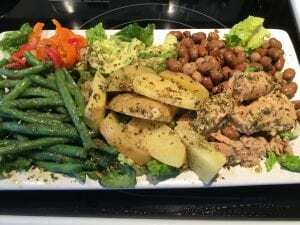 I love Nicoise Salad and I love to mix things up! So my Nicoise Salad with Israeli Zaatar is just the ticket for an ushering in of Spring! My Nicoise Salad with Israeli Zaatar is a Mediterranean dish that serves those who observe Lent and the upcoming Passover! You just can’t get better than this! Serve my Nicoise Salad with Israeli Zaatar during this season of Love, Meditation, and Cleansing of our old stale beliefs. My Nicoise Salad with Israeli Zaatar invites us to realign our thinking, spiritually, emotionally and physically! Enjoy and be renewed! Namaste!